Item #GS-347: 3.5"x1.75"x8.5" tall dark Blue Sodalite Beauty with Child and flowers. Mounted on 1.2" tall wood base. 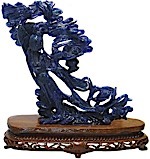 Item #GS-348: 6"x6.25"" tall dark Blue Sodalite Beauty with flowers and birds. Mounted on 1.5" tall wood base. Item #GS-2135: 6 3/4" x 4 3/4" x 5 1/4" tall; Sodalite Camel. Item #GS-820: 2.25"x4.5"x2" tall Blue with Black and White mottling Sodalite Seashell. Item #GS-465: 6.25"x4.625" Sodalite soap dish with black and white mottling.